1. 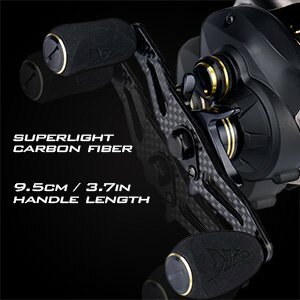 SUPER LIGHT WEIGHT – less weight keeps you casting all day without fatigue. 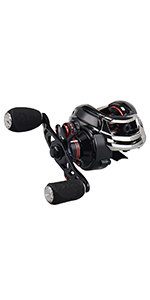 A KastKing Stealth low profile baitcasting reel weighs only 6 ounces. That’s about 20% lighter than other baitcasters. Cast farther with less effort. 2. POWERFUL – Carbon is stronger than steel and lighter than aluminum. 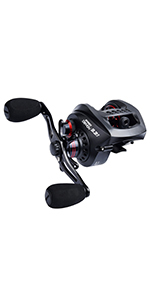 Stealth’s 16.5 lbs / 7.5 kg dynamic drag system with state-of-the-art 4 carbon fiber discs and hardened aluminum washers gives this fishing reel whopper-stopping drag power. 3. 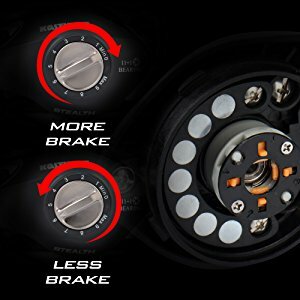 SMOOTH - 11 anti-corrosion shielded ball bearings made from the finest bearing steel plus an instant-stop one way bearing clutch system delivers the smoothest performance and lightning fast hook sets. 4. 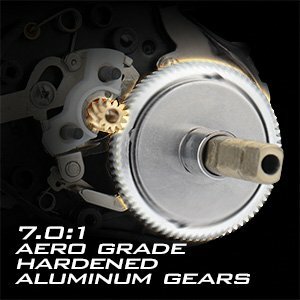 PEAK PERFORMANCE 7.0:1 Gear Ratio, hardened forged aluminum alloy gears, aerospace technology solid carbon frame and body, aircraft-grade aluminum components, carbon fiber handle, braided line ready ceramic line guide insert, sure-grip EVA knobs to give you the highest performance and strength. 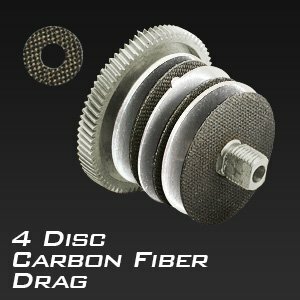 Stealth carbon construction baitcasting reels are 100% corrosion resistant. 5. 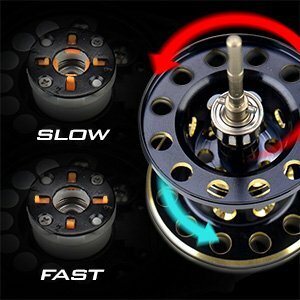 UNIQUE BRAKING – Tournament-ready, wide adjustment range dual brake system combines the best of centrifugal and 7 magnet brake system that lets you tune your brakes for any bait or conditions to eliminate backlashing. 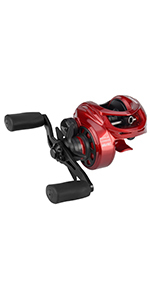 Other fishing reels have only 5 magnets or less. PEAK PERFORMANCE - Carbon fiber handle, braided line ready ceramic line guide insert, sure-grip EVA knobs to give you the highest performance and strength. 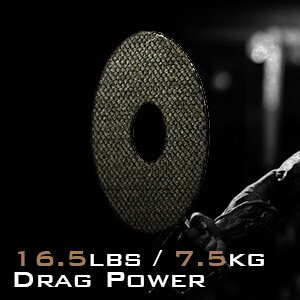 POWERFUL - Stealth’s 16.5 lbs / 7.5 kg dynamic drag system with 4 carbon fiber disks and hardened aluminum washers gives you whopper-stopping drag power. 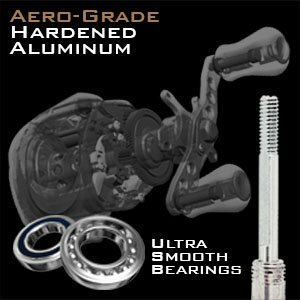 SMOOTH - 11 anti-corrosion shielded ball bearings made from the finest bearing steel plus an instant-stop one way bearing clutch system delivers the smoothest performance and lightning fast hook sets. The reel has become one of my go-to pieces of equipment on the boat. Love how smooth it operates and length of casts. I spooled 20lb backer mono, 15lb Kast Pro braid, with 8lb fluro leader at 10ft. Once dialed in, this thing casts so smooth and with great length. It took a while to get used to due to how fast the spool is. A few lashes at the beginning until it was dialed, but any novice bait caster fisherman can dial one in pretty quickly. I will post an update later this year on how she holds up, but I suspect (being this is my third Kast King reel) that it will not disappoint. Got this reel two days after I ordered it via USPS. First thing I did was break the reel down, gave it a good cleaning, and lubricated it. I done this with all of my reels right out of the box. It just makes sense to me. This morning I went back out to the shop and put 130 yds of Trilene Mono on it to setup and practice. I'll probably use braid with an FC leader for fishing.<br /> I set the magnetic break to 7, the centrifugal break to 5, and the line tensioner was set to the point where the line began to feed out by itself with a 1/4 oz. weight on it.<br /> After 25/30 casts with the reel on my 7' medium action rod using a 1/4 oz lead weight, here are my observations:<br /><br />1. This thing is really light.<br />2. It' casts (even a light weight) a great distance.<br />3. It's fast.<br />4. It's smooth as silk.<br />5. It casts about the same as my Abu Garcia and Lew's baitcast reels but there is a learning curve. You must get adjusted to the speed.<br />6. 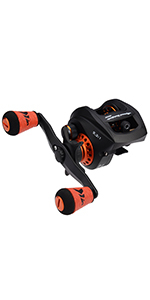 Casting distance seemed to be a bit longer than my other reels but that is subjective on my part.<br />7. I Did Not experience any roaring, grinding, loud squealing or anything else unusual about the reel. Except the speed.<br />8. I had no, zero, zilch, backlashes. BTW, I thrown baitcasters for a long time now and I think most backlashes are a<br /> function of the human at the helm. Not the reel. Just my opinion.<br />9. I made small incremental changes to the brakes and line feed tension until I got the reel right where I wanted it.<br />10. It's a keeper. 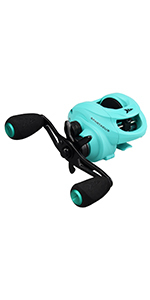 Extremely smooth casting with the proper fishing line and brakes set. 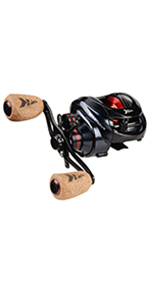 KastKing Stealth an Inside Look - Must Watch Video for Any Angler!